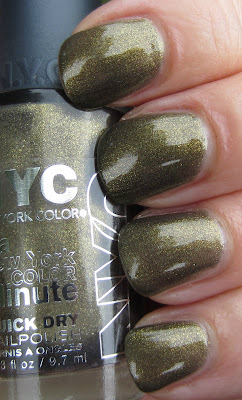 NYC New York Color has a limited edition Fall collection out, and I picked up a trio of nail polish shades when I spotted this at Meijer last week. 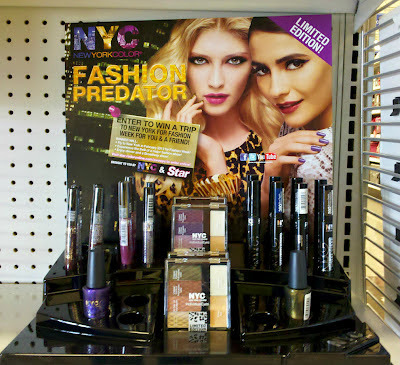 The Fashion Predator Collection includes an assortment of polishes, eye liners, lip glosses, eye shadow palettes, and mascara. 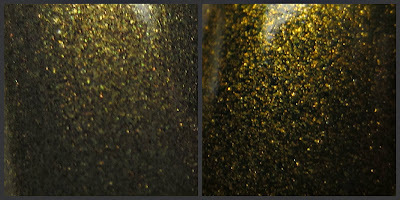 Python Green is a murky olive green shade with a charcoal base and golden micro glitter. The formula is thin--not really problematic, but after the first coat, there were quite a few bald areas. I touched those up and then did a second coat, and ended up adding a third coat. The end result was worth that third coat! This shade likely has some dupes out there, but my first thought was that I thought it was similar to Butter London's Wallis. Swatches on a nail wheel show that they are similar, but not identical. Below the nail wheel photo are macro shots of each one, NYC on the left, and Butter London on the right. Wallis has more gold, and the finish is more refined. Lethal Purple is a medium grape purple tone with very fine shimmer. When I look closely, I can see tiny magenta and blue shimmer pieces in the mix. This shade has a very pretty "glowy" finish, and while not unique in color, I do like this shade. 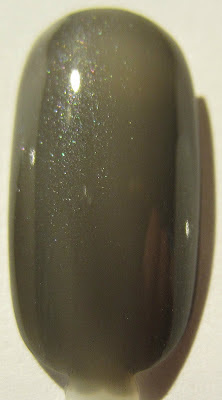 This one was also thin and I used three coats. Rock Muse is noted as a "Top Coat Fixateur" on the bottle, so I assume it's meant to use as a top coat over other polish shades. I'm sure you can use it alone as a nail color, but I used it over Python Green and Lethal Purple just to see what it did. 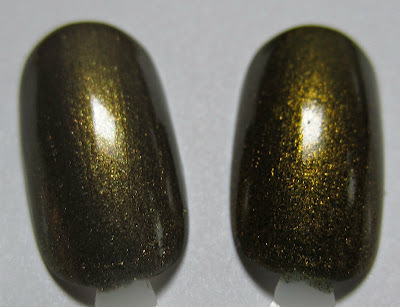 While it didn't morph them into anything extraordinary, it is an interesting polish. Below is two coats of Rock Muse on a nail wheel, and it's a medium charcoal grey (thin formula) with tiny multi colored micro shimmer that's primarily blue. 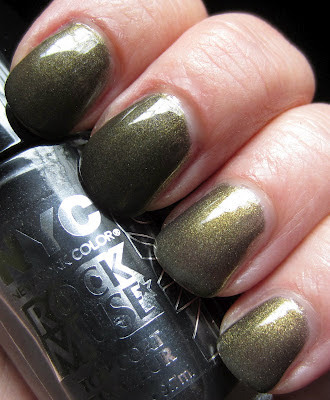 Below is a coat of Rock Muse over Python Green on my index and middle (top two) fingers. It tones down the shade, darkens it a bit, but doesn't totally change the color. I like the effect, and it will be intersting to see what it does over other shades and finishes. I also want to note that the photos above of Python Green were taken outdoors, and the photo below was taken indoors. 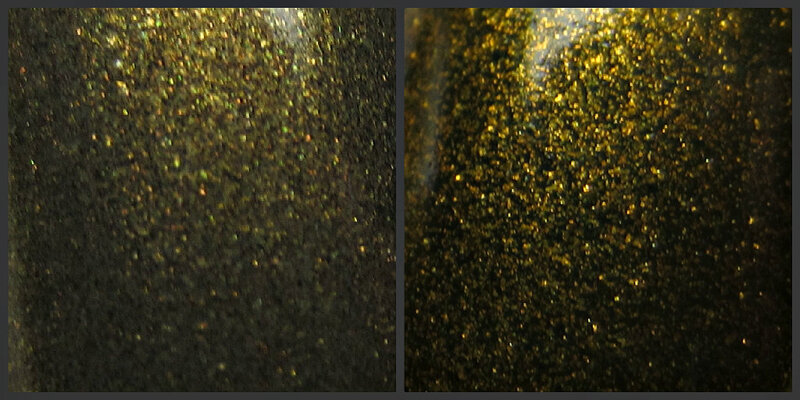 You can see the smokiness/haziness in lower lighting of Python Green better in this photo. Here's a look at one coat of Rock Muse over Lethal Purple (on the two nails on the left). Subtle changes, but I think this polish will be useful for certain applications. I want to try it over some glittery polishes next. 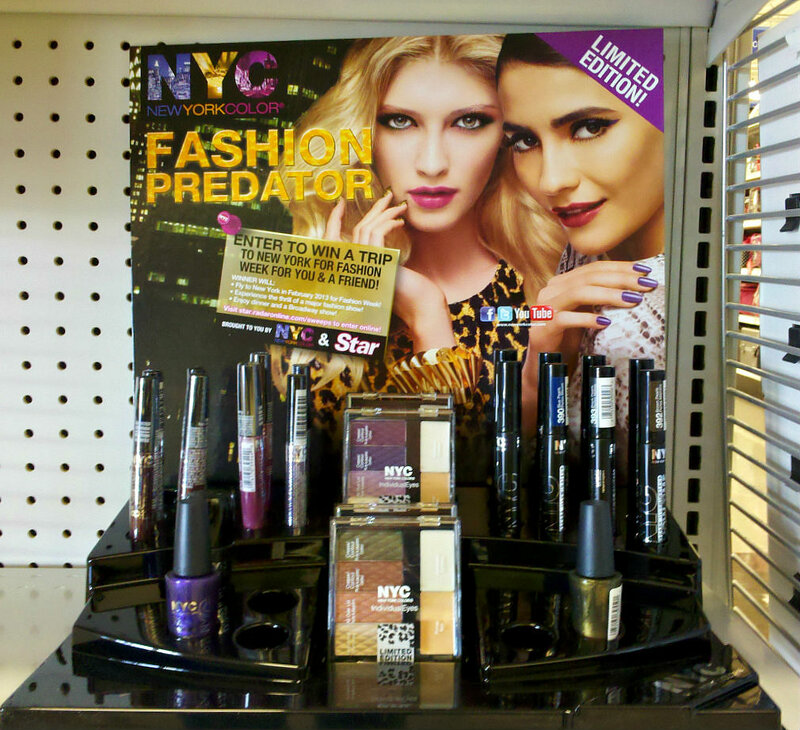 If you're out looking for this collection, here's a quick shot of what the display looks like. The Green Python and Lethal Purple retailed for $1.79 each, and the Rock Muse retailed for $2.39. Hmm that Rock Muse looks nothing like mine! Where are the glitters? Seems like they mixed up some bottles :-( Or maybe US edition differs from the European?